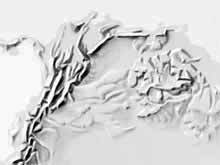 Shaded relief presented at small scales has to accentuate major landforms, such as mountain ranges, tablelands or volcanoes. At small scales, an exact geometric reproduction of an area is neither possible nor necessary. Africa (section eastern Africa with Rift Valley), © Department of State, USA. Europe (section), original scale 1:15 million, © Schweizer Weltatlas. 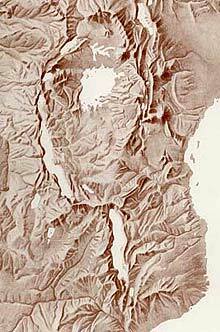 For the successful portrayal of shaded relief, the cartographer has to know which topographical landforms to emphasize. 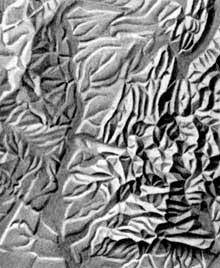 At large to medium scales, contour lines serve as an indispensable framework in order to impart an idea of the form of the terrain, when producing shaded relief. 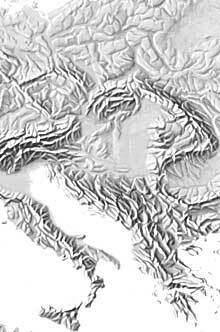 At small scales, contour lines are not ideal drawing bases for maps, because the lines are too dense or tangled to depict the terrain in a correct way. Structuring lines are the preferred base information for relief shading at small scales. These structuring lines, which serve as a visual framework, consist of river networks, coastlines, and boundaries of drainage basins, ridgelines, terraces and other morphologically important forms. The smaller the scale is, the more important these structuring lines become. River network and crest lines in southern France, 1:2 million. Resulting shaded relief by Regula Spiess. The same area can be depicted in very different ways. Determining which topographic features to accentuate is up to the cartographer. The shaded relief examples below show the northern part of South America. 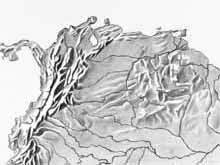 The example on the right probably displays the terrain more clearly, emphasizing the main ridges of the Andes, the eastern tablelands, as well as the intervening Llanos and the Amazon Basin in the south. Northern South America by Peter Schmied (left) and Jan Karel (right) © Institute of Cartography and Geoinformation, ETH Zurich.